Building automation systems help in monitoring and controlling mechanical operations inside commercial buildings, residential areas and other such premises. They operate on a centralized network support with various software that control and monitor the building's energy demand, security control as well as heating & cooling systems. Further, growing alertness towards energy saving due to rising costs would propel the demand for energy-efficient buildings in UAE. 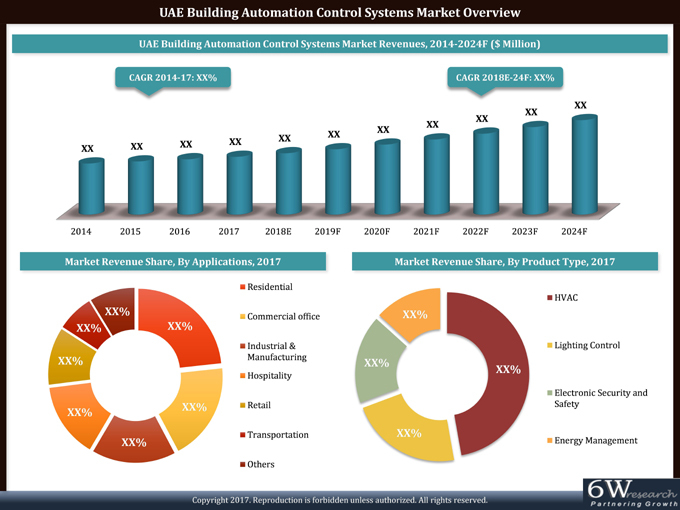 According to 6Wresearch, UAE building automation and control systems market size is projected to grow at a healthy CAGR of 7.5% during 2018-24. Increasing infrastructural development and growing investment in commercial and industrial sectors under the country's development plan - UAE Vision 2021, would act as a major growth driver for the building automation systems market over the coming years. The Residential and commercial sectors occupied the highest UAE building automation and control systems market share in 2017, while the hospitality sector is projected to witness the highest growth rate during the forecast period on account of increasing hotel and mall construction activities in major cities such as Dubai and Abu Dhabi. Tourist footfall is predicted to increase as a result of the Dubai Expo 2020, which would act as the key growth driver for the hospitality sector in the country. UAE building automation and control systems market report thoroughly covers the UAE building automation and control systems market by product types, applications and regions. The UAE building automation and control systems market outlook report provides an unbiased and detailed analysis of the UAE building automation and control systems market trends, opportunities, high growth areas and market drivers which would help the stakeholders to device and align their market strategies according to the current and future market dynamics.